With soaring food prices, indigenous peoples in India are going back to raising small local black pigs. With knowledge-based support, they could tap into new market opportunities and double their incomes. This is Nagaland, one of India’s most insecure and poorest states. It is in the country’s mountainous northeast corner. Remarkably, even remote villages here are affected by the rising global prices of milk, meat and cereals. 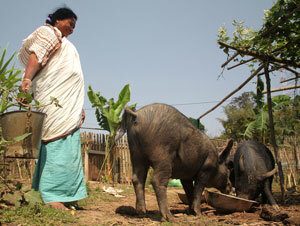 Most Naga ethnic groups have always kept pigs. Pork remains their preferred meat. Now, today’s skyrocketing grain prices mean the small black pigs these tribal peoples keep, which are adapted to local feed resources, have suddenly become more attractive than big white imported pigs, which have to be fed on expensive grain. India: Over 300 million people, 27.5% of the population live below the poverty line. Northeast India is the easternmost region consisting of the Seven Sister States. It is home to 38 million people. The region is linguistically and culturally very distinct from the other states of India and officially recognized as a special category of States. Nagaland is home to 1.99 million people. 19% of the population or 399,000 people live below the poverty line of which 387,000 live in rural areas. Assam is home to 26.6 million people. 19.7% of the population or 557,700 people live below the poverty line, 545,000 of them in rural areas. Poverty statistics source: Government of India Planning Commission (2007) Poverty estimates 2004-05. ‘Apart from keeping pigs and farming, women like us don’t have any other ways to make money. Pig farmers in Nagaland and Assam now have a window of opportunity to step up their pig production and sell their native animals across the two states. But as markets for pigs are getting larger, so is the market chain, making the business of supplying disease free, safe meat increasingly hard for small producers. On top of that, there are no functioning breeding schemes or feed systems that would allow farmers to intensify. This lack of quality knowledge is stopping expansion in a rapidly changing industry that could benefit many of the most vulnerable members of society, such as women and children. Without this critical knowledge-based support the opportunity for millions of the world’s poor to climb out of poverty through enhanced pig farming and marketing will be lost. Development agencies have tried for decades to raise the very low household incomes in Assam and Nagaland. 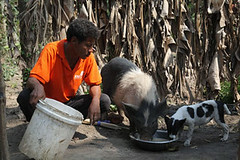 But even though pig keeping is central to the livelihoods of the poor and especially poor women, pig production has seldom been viewed as a development tool for the region. This is peculiar because until recently local demand for pork was so great that it was profitable for local business people to import large numbers of commercial white pigs from producers in India’s grain states further west. Animals were being transported 2000-3000 kilometres, at a cost of USD40 each. But grain-based feeds and transport have both recently shot up in price, adding even more to the cost. People in Assam and Nagaland are suddenly finding the imported white pigs far too expensive. A new market is growing fast for the local black and cross-bred pigs. Because these native animals can be fed mostly on low-cost feed crops and crop wastes, they are an ideal solution to fill the new pork and piglet supply gap. However because markets are changing so fast smallholder farmers can no longer make it alone. They lack access to information and resources, linkages to health and breeding services, business support, and feeding systems. All these are vital if they are to expand while also meeting increasingly demanding new health and safety standards. This short-term opportunity is ready-made for success. The pigs are there, the demand is there, and farmers ambitious to grow their pig enterprises are also there. With relevant knowledge and training, both of which ILRI with its national partners are ready to provide, most tribal households in these states could boost their herd sizes and double their incomes sustainably and in a cost-effective way over the next 5–10 years. Without support, millions of people will increasingly suffer poverty, conflicts, and the loss of dignity that goes with forced migration to cities. However, with help, they can maintain the traditional livelihoods that sustain communities and generate prosperity. ILRI’s representative for Asia, Iain Wright, says ‘We are working with national partners to gain support for helping poor people seize this big pig marketing opportunity in Nagaland, Assam and other northeast states. ‘We have recently started a project with the Indian Council of Agricultural Research and the School of Agricultural Science and Rural Development, Nagaland University, to implement a programe of research to improve the production and marketing of pigs in selected villages in Mon District, Nagaland. We’re also looking at working on similar projects with national partners in other notheastern states’, says Wright. The Nagaland pig production and marketing project is funded by the National Agricultural Innovation Project with a contribution from the International Fund for Agricultural Development and aims to develop sustainable solutions to livelihood improvement in one of the poorest districts in India. This entry was posted in Animal Production, CRP37, ILRI, India, Intensification, Livestock-Fish, MarketOpps, Markets, PA, Pigs, Southeast Asia, Value Chains and tagged Assam, Nagaland by ILRIComms. Bookmark the permalink. is there a centre in the n-east india from where piglets can be procured? I want to start Piggery Farming. It is my entry level. Before entering, I want to become assured whether the business is profitable or not. Please guide me along with the project report as on date. Thanks n waiting for your reply. I have got a pig farm of my own but i can provide you piglets only in April/May. what type of breeds do you keep?i am interested iun yorkshire.the white breed. Assam Livestock & Poultry Corporation (ALPCo)is going to run a pork processing plant in Guwahati under PPP model shortly. You may try to visit the ALPCo office at Panjabari, Khanapara. Also, there are several pig wholesalers in Barnihat (Guwahati) and in Dimpur who buy bulk quantiy of pigs and supply these to different states/ districts of the region. You may try to contact them. Hi, good to see your suggestion . I would appreciate if you can suggest me how to start a mid size piggery farming at Guwahati. I have manpower and land. Would appreciate if you advice me on the above. I am form guwahati and would like to meet you for piggery farming suggestion. Would appreciate if you can spare some time for me on the above. Looking for a favourable response . It was a pleasure to see you in ILRI-Guwahati office. Hope my suggestion has helped you in moving forward. Please give me a call if you need any further information. Thanks a ton sir for your advice and sorry for not keeping in touch with you for so long. Sir, I have started the farm this year Jan 30th 2013 and current strength of pigs are 20 out of which I have 11 Castrated, 7 female and 2 male for breeding. Looking at my current farm performance post one year I want to expand bigger and for this I will be needing help from you all. I have been hearing news of SWINE Fever spread out in our nearing staes like Manipur, Mizoram also in Assam Guwahati many places and 100 of pigs mortality for the same. I have procured my piglets from NRCP, Rani,Guwahati / Vetenary college Khanapara Guwahati as per your advice where initial vaccination were been given as authority claimed. At present there has been huge confusion over the swine fever vaccine available here as Manipur / Mizoram govt ordered from outside state and few from your institute also as I have seen in news. As Pig farming is restricted in NE mainly to section of people who are unaware whats happening all across also lack of knowledge of better vaccination make the farming not viable . Therefore I would be greatfull if people like you advice us and guide us to take piggery farming as a passion and livelihood. Planning to meet you soon and would appreciate if you visit my farm once as one of the female shown 1st heat sign and I am waitinng for 2nd heat sign for artificial sementattion. M pig Farmer in Patiala, Punjab. I deals in (Live pork) white york Shire & land Racer in the region. i can work with u according to ur requirement of pig parts. please send the process of transportation & quotation for the same. i want to sale my pigs, from assam udalguri , mazbat. I m operating a pig farm just 1 month. In Bongaigaon (Assam). 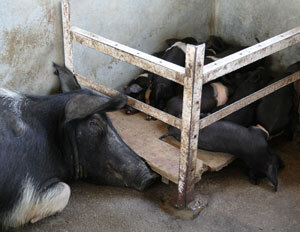 I want your help b’cos i want 2 make a big pig farm in lower assam. So i hope u will be help me. Happy to learn that you are going to start a big pig farm in Bongaigaon. I will be pleased to share some of my ideas and views on this. I am based in ILRI-Guwahati office. If you visit Guwahati in near future kinly let me know (r.deka@cgiar.org). I will be pleased to meet you. I am 4m Nagaland and i would like to start a Piggery farm for commercial production but i am not sure which breed will be suitable for our State so, can anyone pliz give me some suggestions? Great!! Pig producers in NE India (except Mizoram) mainly prefer black pigs. There are several breeds of black pigs (or their crossess) available in the region which include Large Black, Hampshire (with a white belt on the chest)and Ghungroo. You may go for anyone of them. Majoriy of producers in the region prefer Large Black breed (or its cross) than the remaing two. i am operating a small pig farm in bongaigaon. but want to operate a big farm in here so, need your advice in this matter. and address and possible pig dealer contact where i can make a bulk suppy. Thanks for your kind information on pig farming in northeast India.I am studying bba course now and iam in 1st year.I just love animal farming but dont have any farm yet,and i love pigs the most,and iam thinking of starting my career in business with pig farming as i am doing business course now.So can u please give me some important informations on good varieties of pigs which are breeded in northeast region & can well survive there without much medicinal inputs.So that one day i could supply the best possible pork meat to northeast & then to others too. I Prakash Mandal Own my pig farm in west bengal. I would sell pigs in other state. Kindly contact me. i have experimented with pig feed for a few month and i am planning to start my own organic pig farm in dhansiri under karbialong district of assam. at the moment i am depending on local breed and looking for a superior germplasm institute in north east india. i will be grateful if u can enligthened me on the above two subjects. i feel the demand for local breed is in demand and regulation of price is violatile as in nagaland local piglets is sold frm 1800 to 2500 respectively. i need some technical assistant frm you to promote among the community and sustain a livelhood among the community. hello, i am from manipur.. i am looking for good quality boar to breed with my black variety of local sows. And can anyone please enlighten me on how artificial insemination is conducted here in north-east india.. thank you..
i want to start a big pig farm in uttarakhand. please tell me the market for sale ? Please contact the Uttarakhand agricultural department for information on pig markets in Uttarakhand. Thanks. @Maxy: Please check out ILRI’s website and repository, called Mahider, using Google search to find and review all our publications and information on pig research in Nagaland so we can help you with any specific requests. You can also contact Ram Deka, based in ILRI’s office in Guwahati. Many thanks! I am from Assam NRLM, State cell. Office at Guwahati , Khanpara, SIRD complex . Want to meet u urgently to discuss some issues related to NRLM piloting in Assam . Please give a call . I am starting a big farm in Tuensang district,Nagaland. Can someone please suggest where can I buy quality pig in Assam? Am looking for Long white Yorkshire, Hampshire, Landrace and Ghungroo. 10 Sows LWY, 10 Sows Landrace, 4boars (LWY,Landrace, Hampshire, Ghungroo), 40 piglets of 3-4 months LWY, 40 piglets of 3-4months Hampshire. Please share contact details. I’d be very grateful. Sir, kindly contact this no 8732817507. You did not mention about the location of your farm. You may perhaps be aware that there is good demand for good quality piglets in almost all NE Indian states. Govt. farms and other small commercial farms are not in a position to meet the local demand for piglets. Piglets are mainly sold at the farm gate and/or weekly market. There is also a network of traders who regularly buy piglets from surplus areas (eg. Dhemaji, Lakhimpur) and sell it in deficit areas (eg. Nagaland, Arunachal, Morigaon, Kamrup etc.) of the region. But all these market chains are operating within the state or the region. I am not sure how you can avail the opportunities of growing market demand. i m frm meghalaya jowai urgently wanted to have a good breeds of piglets.i hope ram deka sir can help me out in this purpose.my contact no is 9863028696.plz gv me ur mob no so that i can com down to guwahati n meet u. It is really difficult to get good breeds of piglets in the region. Nevertheless, you may try at ICAR farm(Kridumkuli/ Umiam, Meghalaya), Meghalaya state govt. farms, Vety. college farm (Khanapara, Guwahati), NRCP pig farm (Rani, Guwahati) and few other small private commercial farms situated here and there. i want to know how to start a new piggery at darjeeling. kindly advise me with all details.it will be better for me take aright decision. 3. Identify a suitable land for farming. Land should also be available for cultivation of food feed crops like sweet potato, tapoica, taro etc. for feeding of pigs. 4. Do not invest heavily on housing at the begining. Invest liberally on getting good quality piglets, feeds (concentrate) and health care facilities, if possible. 5. Start from a smaller herd. A mixture of breeding and fattening herd would be better. 6. Try to vaccinate the pigs against Swine Fever and deworm the pigs regularly. 7. Adopt better clean & hygiene practices in the farm-state and surroundings to prevent from infectious diseases. 8. Consult with a local vet for the details. I am not very aware about the market opportunities for pigs in your area. I can just inform you that in UP there are some traders who regularly supply pigs to north east India. You may perhaps visit those traders and can try to create linkages with them. I suggest that you should not invest on pig farming without assessing the market properly. Try to get first hand information from the traders. I want to start a pig farm but could not find any trader online. please inform me about the traders in and around punjab so that it would be easy for me to sell piglets and pigs whenever I want to. also tell me appx. prize of piglets of around 2 months. Iam Martin Rabha working for a an Organization call DiYA Foundation. (Df) based in the south-west part of the LGB Internation Airport via. Mirza call Loharghat. Aprox. 21 km from the airport. We have develop a concept on Piggery Development and would like to promote the activity with the SHG’s. Presently we are looking for Piglet Breeders where we would like to procure in bulk and distribute among the SHG’s. Sir/Madam Could you please suggest us to whom should we approach so that we can procure with subsidized rate. i am from distt. muzaffarnagar, uttar pradesh, i am going to start apig farm. can you make me aware about thatwhere to sell the pigs after completion. i am worry about the scope is there a good scope for this. thank you? i want to set up a pig farm in my state.so where can i procure the pigs and especially thier food??? i would like to thank all well wishers and participant in this important work and business of pig production to improve income of the poor and am one of them who is campaining for that in my country uganda also and pig farmer and agriculture extensionist worker.and would encourage fellow farmers to do more research and training to improve and they can make it in your focal point of interest. I have a Farm in Aligarh (Uttar Pradesh). I have sent you an email also about my query. Can you please provide me the contact details of the Traders who export pigs in North- East. I have Large and Middle white yorkshire breed. If you want to buy pure breeds and boars then you can contact me. I can fulfill your requirement on breeds, piglets, boars and pig for slaughtering. From your message I could not make out where you would like to start the business and for what type of pigs (piglets or fatteners). You may kindly send me an email at r.deka@cgiar.org with the details. Does anyone know where in Eastern India, hams are processed and packed in International Standard ? Also would like to know if there are any High Class Organic Piggery in West Bengal who can supply live pigs? farm i want to know about it . Please go to the link below to download the training manual on smallholder pig management published by ILRI. Hope you would get necessary idea from the manual for starting a pig farm. I am from Distt. Kanpur Nagar, Uttar Pradesh, I am going to start a Pig Farm. can you Please guide me about where to sell the pigs after completion. Please Give me the Contact No of reputed purchaser if pigs from Kolkata. I am worry about the scope,is there a good scope for this. thank you? 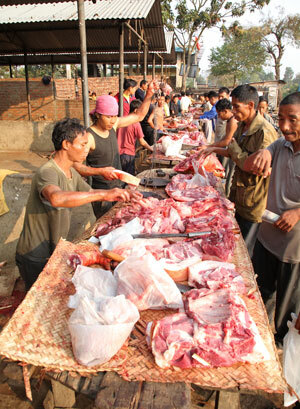 There is a good market for slaughter pig in North East India. Some of the wholesalers based in NE India procure pigs from UP and other northern Indian states and sale it in NE India. The wholesalers are originally from that region. I think, you may explore the links of the wholesalers in UP and try to sell pigs to them. Please note, volume of this market is gradually shrinking because of some reasons. You will find some pig suppliers at Jorabat-Bornihat area (on G. S. Road), near Guwahati. You may try to contact them directly by making a visit. As we are not dealing with pig marketing (we are basically a research institute), it is difficult for us to give you specific information about any trader. i want to start a piggery farm in gorakhpur . i want to know all about piggery farm .and most important if i produce more pig so where did i sell it. Thanks for your message. Please see my replies above in response to the quarries posted by Harenda and Ram Kumar. My cell number is 09435547126. I have a piggery farm in Lucknow having arround 110 yourkshire fattners aged about 6 months. In our area retail purchasers are very frequent, but for a healthy and competitive market I want your suggestion, whether you have contact nos. of buyers having capacity to purchase in bulk. Your suggestion is very much helpful for me. Sorry, I don’t have contact numbers of the traders who deal with pigs selling in bulk quantity. I have Large white yorkshire breed. Sorry, I don’t have the contact number of the traders. As far my knowledge goes there is no government pig farm in SonariI. Nevertheless, you can speak to the local vets based in Veterinary hospital, Sonari town for sourcing piglets from small private farms. Sorry, we are not involved in those kind of business dealing. iam planning to set up piggary farm in sunitpour district. is it profitable i mean i will not invest big amount . where i get baby pig? where i will get market? and plz plz let me know that price of baby pig and after how many months can i sell and sell price? iam totally new though iam planning coz its my interest. we are doing pig farming here at kanpur.Now this time we have more than 200 pigs weight averaging nearly200kgs each but we are unable to sell it at good price.We require a company/person /society to purchase it from us. I will be grateful if u advice me,Where I`ll get large white Yorkshire piglets (pure breed).. I`m ready to invest 5k to 10k per piglets …sir, i am from itanagar . we dont have good pig farm in our state . sir I have 14 sows and a boar… these are crossbreed. Once again I will be vary grateful if u help me… I want to make more profit by upgrading a farm …100to 300 pigs.. I have good land about 2000sm . We have started a farm of 500 sows with the latest technology. Do let us know if anyone is interested in getting a better breed of sows/piglets, the latest construction technology, & the latest feeding system. I am Diphu. Please tell me about the breeds of swine and where have you started it. My cell No is 09654536423 and mail add. is bbasumatary.air@gmail.com. Sir, I have complete training in pig farming. Now I am going to open his City farmhouse. One Year After the May pig’s head to help me sell and told me where to find the best rate in India. Please help me sir. Many thanks for your message. Those who are interested to know about pig marketing please be informed that our institute (International Livestock Research Institute) conduct studies and action research on different aspects of livestock production and marketing but does not involve in any kind of trading and also does not keep contact details of any market actor. Therefore, if you are interested to learn about the prevailing system of pig marketing in North East India you may kindly post your comments on this blog, otherwise if you are only interested to learn about the contact details of market actors and business linkages, we would not be in a position to help you out. Sorry for that. Those who are interested to learn about starting a small pig farm and its management and economics, you may kindly go through to the link below to download our training manual on smallholder pig management. sir, i want little bit of help to start my small pig farm. Hi i m a exporter from ghaziabad uttarpradesh, we needof 3 months of yorkshire & landracer ( live stock ) for supply. pig fooding, pig leaving ,pig buying pig selling ctc…. We need 200 yourkshire pigs fully grown up every week. Sellers from Uttar Pradesh can contact us on E-mail: dimapurpigs@gmail.com at our Lucknow Centre. I want to open the Pig Farm in Gurgaon Haryana and i want to know from where i can buy good breed of SOW and Gilt my requirement is 10 White long Yorkshire SOW or Gilt, 10 Durco SOW or GILT , 5 Landrace Sow or Gilt, 5 Middle white Yorkshire. I have seen your other post as well to buy it from (NRCP), Rani, Guwahati but i am enable to contact them and i want to know they give the piglets only of SOW and Gilts also. i also want to From where i can get some short duration Workshop or Training on Pig farming. I am thinking for Astralian Pig white Farming in West UP and know that this has been taking growth. Please let me know about buyers of white pig. For inquiries on Pig Development/Farming is the address mentioned below holds and if yes can you provide me visit timings and Days suitable to hold discussion on the same. I would like to know where are you located and which breed do you wish to sell and what will be the best rate you offer. Send me all the related details to make my decision. i want to start pig farming at manipur state senapati dist.could you please suggest me from where i will get the basic training within in the location of north east india. Pl feel free to contact us. sir, i already have a piggery maintained by a private ownership and my request is to ask you any information regarding NAGALAND PIG FARMERS ASSOCIATION(NPFA).if you can kindly provide me an e-mail , contact number or the address or location where NPFA is located in Nagaland. dear sir, i m writing to you for the 2nd time… i kindly request you to provide me any information regarding NAGALAND PIG FARMERS ASSOCIATION(NPFA) its address , e-mail or contact number. Hello Everyone, My name is Mayur gogoi, i am going to start Pig farming, can anyone guide me on it? i know very little about pig markets and also can anyone guide me on that it will be very helpful. Please do advice me any help will be great, do contact me: 7896908009. Pl accept my heartfelt gratitude and well wishes in pursuing noble cause.We are strong association of farmers and true producers at Delhi and Uttar Pradesh region and are ready to guide and help our brothers in north east. We can help by trg, investment, guidance and our experinces. The biggest challenge the faced by farmer is middle men and meat mafia.This causes profit loss and trade loss. for all our good let me explain how this mid trader chain works and its our years of experience and lead. 1. Traders from delhi, and other region buy live animal as low as @85/kg from various farmers(strong network). 2. Transport it till guwahati @ Rs1 lakh per truck which consists of 35 animals. 5. If anyone tries to sell directly then trucks get looted enroute. 6. Undergrounds demand for local govt tax. (@20 lakh, 25 lakhs & 50 Lakh). I would like to know the procedure to export the pork. Is there any market in India to sell the Piggery or pork. i am so happy to help u ………………………….